Quarter Saw, the log is divided into four parts like a piece of pie would be cut, it is then cut into strips of wood. Rift Saw, the log tends to be cut at a different angle, like a pizza, this makes it much more stable than the previous entries. It also makes the hardwood flooring prices much more expensive. Once the strips are cut out of the original log, they are graded by their appearance and then they are planed on all sides to smooth the saw marks out and to make them level. After the strips are planed to perfection, they are put into a machine that cuts tongue and groove edges so the boards can fit together tightly, but all are given enough wiggle room to allow for expansion and contraction of the planks after they are installed, due to weather and humidity conditions. If the homeowners are looking for that rustic distressed look the boards still aren’t ready to go in as they are hand-scraped or distressed next. Finally, the planks of wood are sealed or stained with a protective finished or if you elect to do so, shipped out unfinished. Depending on the type of solid wood the consumer chose, the price is reflective in the rarity of the wood type or the level of difficulty the wood is to work with. Some prefer their floors to be pre-finished as it makes installation less difficult. However, those who decide to finish the wood after it is installed will take joy in the fact that the wood will actually retain the seal used longer. Dry solid sawn, is slowly dried out with a low level humidity so that the moisture inside the woods cells remains intact. This reduces the risk of cupping. 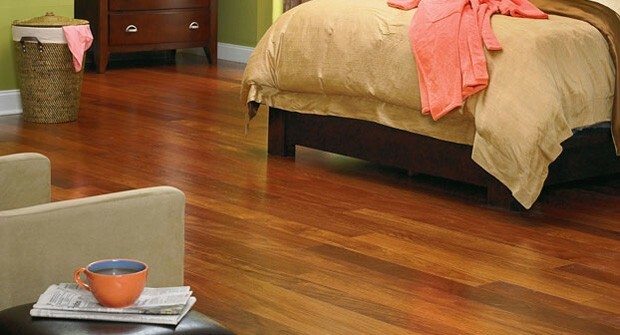 This variety of engineered wood looks and feels most like a solid hardwood. Although it seems like the only choice in engineered wood, it is the most expensive so lets look at the other two. Rotary peeled, has a lot of issues with cupping and warping, it is created by scraping wood from the outside of a log to the inside after being boiled. This wood is the cheapest of the three but, it looks least like real hardwood and lacks in structure. Sliced peeled, is also formed from a boiled log, but instead of being scraped it is sliced from the end. Its price range is in the middle of the other choices with equivalent stats to back it up. In other words it looks a little more like real wood and its structure is a little more solid. So as we have learned, hardwood flooring prices vary depending on the construction and installation of the wood. It is important to do your research to see what best serves your needs. Always remember though, paying a little extra up front can save you a lot in the future.